This photograph shows Quorn Cross during some heavy flooding. Otter's took over from North's as the Post Office and as a grocery store. Dates are uncertain, although it is known that Mr Otter was in charge in the early 1940's, then his assistant Mr Smith took over (possibly about 1947) - and was there until the mid 1950's. Can anyone help with more exact dates? 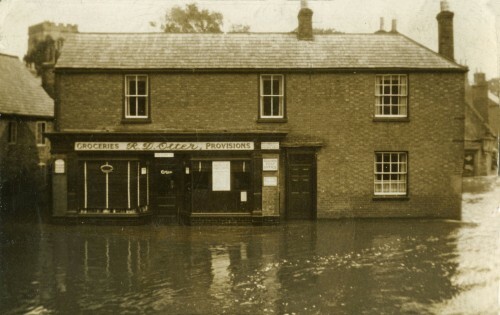 This picture may have been taken during the particularly bad floods during 1932 or 1933. Missing information: Do you know exactly when Otter's ran the Post Office on the Cross?